It folded to Anton Vinokurov on the cutoff and he moved all in with :::Kh:::6d. Vitalijs Zavorotnijs called from the big blind with :::Ad:::Qs. 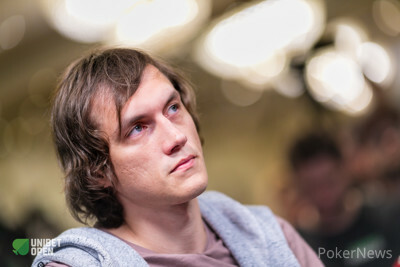 The board ran out with a :::6h:::3d:::5h flop, giving Vinokurov the lead. The turn was the :::Ts and the river the :::7c and Zavorotnijs wasn’t able to catch up on the chip leader, who now extended his lead again. The level duration will be reduced to 45 minutes from this point on. If the tournament gets 3-handed the duration of the levels will be reduced to 30 minutes.